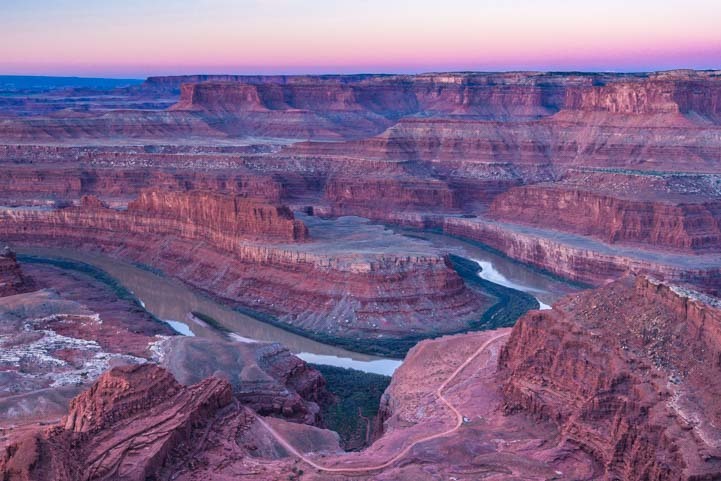 Dead Horse Point State Park, Utah – Magical Sunrises! 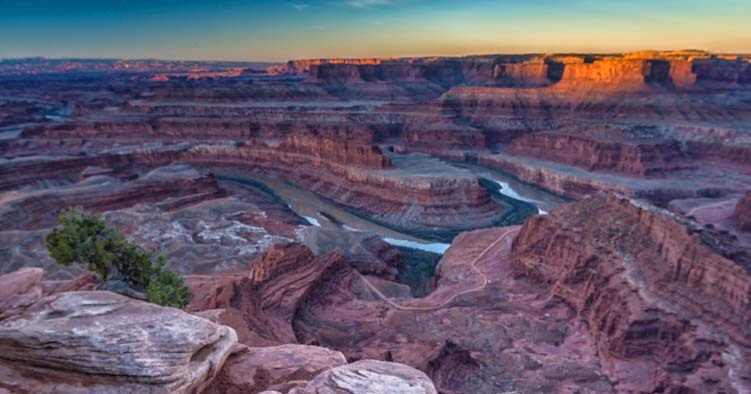 April 2016 – The area around Moab, Utah, is teeming with exotic red rock canyons, towering natural stone arches, snowcapped mountains, exotic ancient rock art and exhilarating hikes that go through it all. 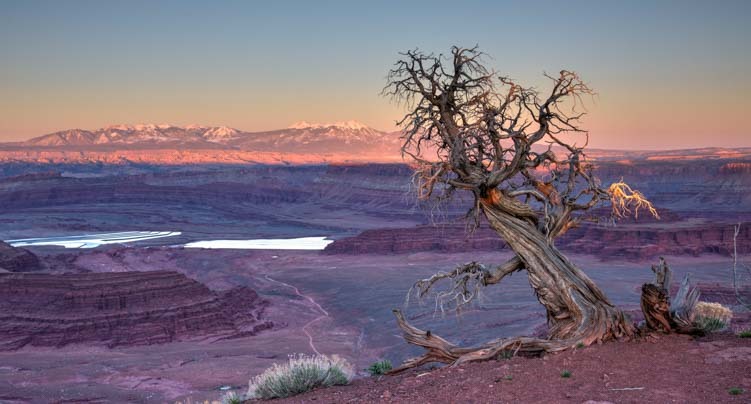 The rim of Dead Horse Point State Park is fabulous for photography at sunrise! 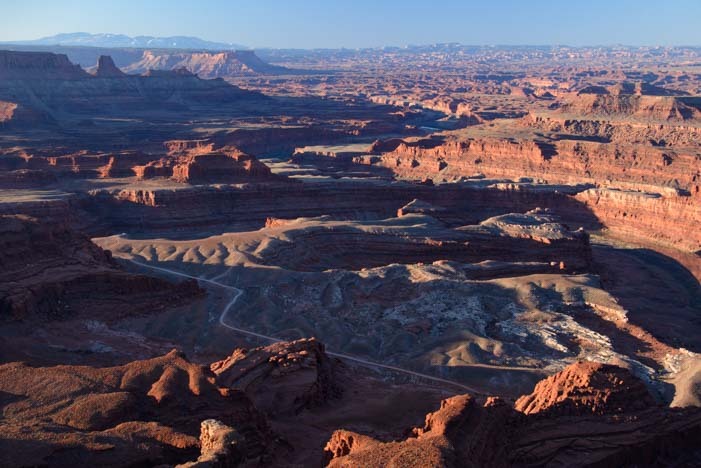 There is a joke that southern Utah’s landscapes are so spectacular that many places would be National Parks if they were located in any other state. But they get relegated to mere State Park or even lower status because they are located in Utah. 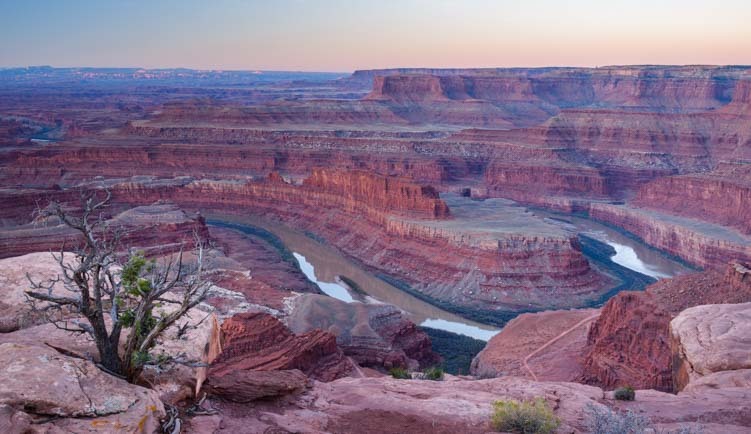 Dead Horse Point State Park is such a place. 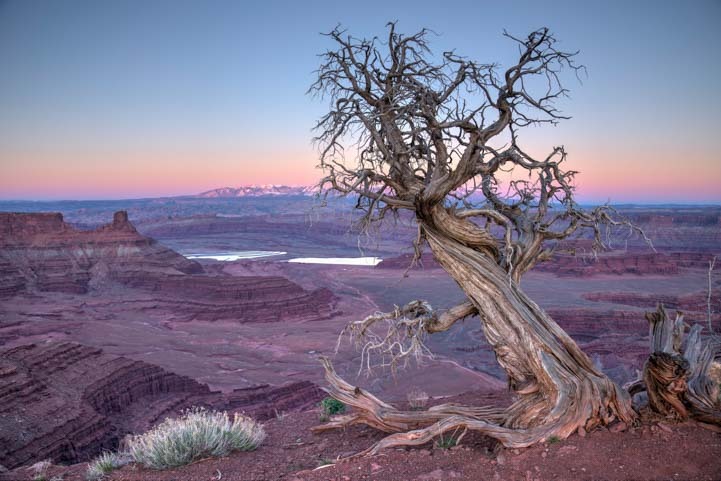 Dead Horse Point State Park in the pre-dawn hours. 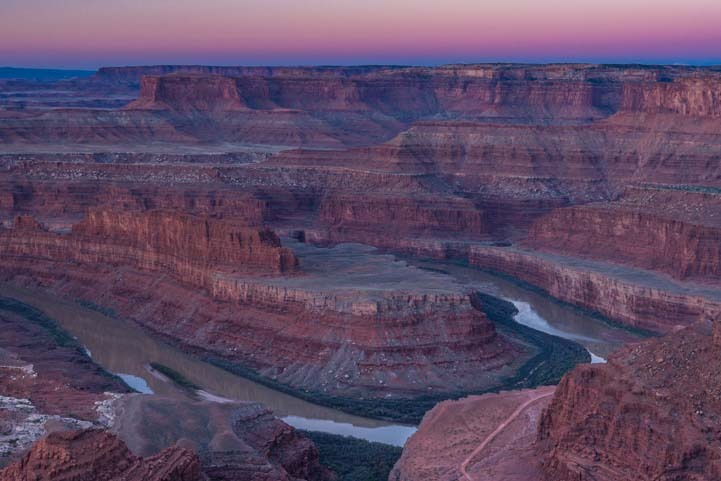 Lying just 12 miles from Moab as the eagle flies across the canyons — or 33 miles as the roads go around them — Dead Horse Point State Park is tucked into a dramatic bend in the Colorado River that resembles some of the curves in its big brother, the Grand Canyon, a few hundred miles downstream to the southwest. 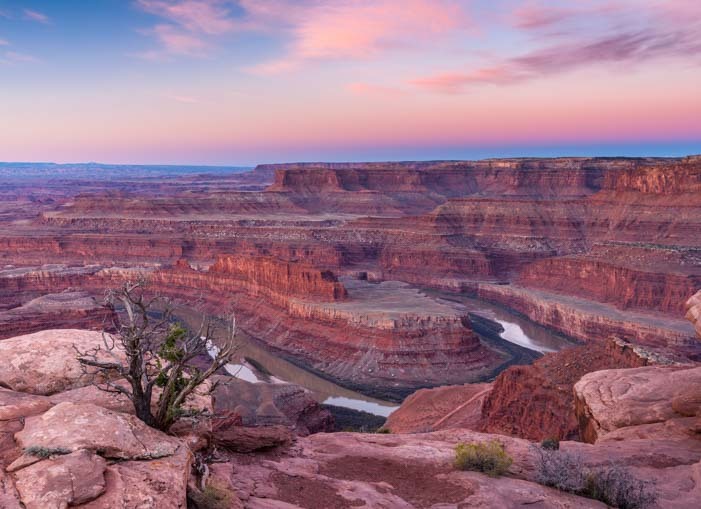 The overlooks at Dead Horse Point State Park are eye-popping at any time of day, but to watch the sunrise there is a magical experience. We snuck out in the pre-dawn hours and tip-toed around the edges of the canyon in the semi-darkness, passing endless wonderful, gnarly old trees. One tree in particular kept drawing us back. It leaned over the edge as if wanting to take a closer look at the canyon. …so it wound up in quite a few photos! Another stood watch over a bench at a viewpoint. 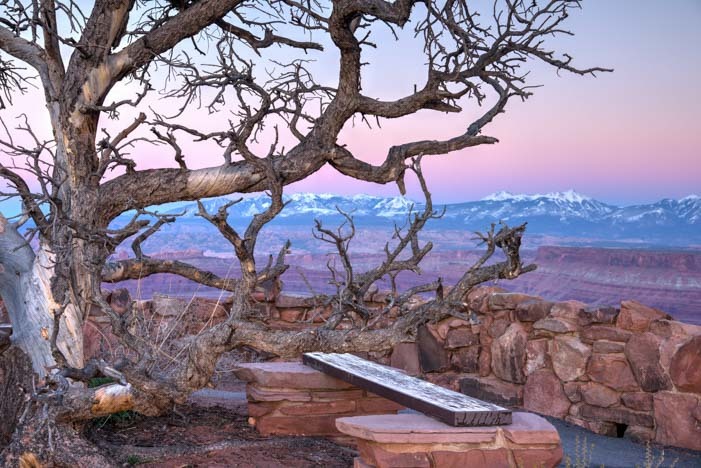 A tree looks out at the view over a visitor’s bench. 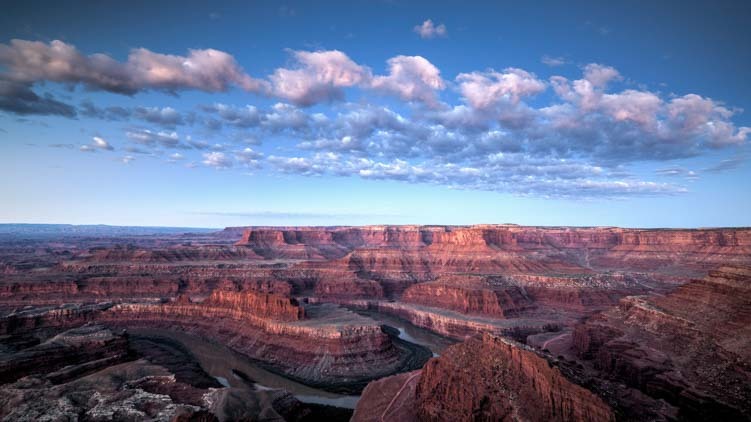 As dawn flirted with us on the horizon, the curves and contours of this magnificent canyon slowly began to take shape. Gradually, the wispy clouds in the sky took on the brilliant peach and orange hues of sunrise. The sky lights up as the sun begins to rise. What a blessing it was to be there on a day when there were enough clouds to create a colorful sunrise! 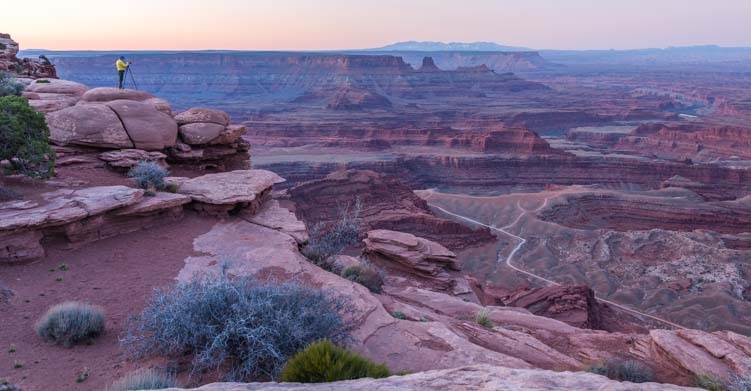 The thin trail along the river is the 4×4 White Rim Road that crosses into Canyonlands National Park. All of a sudden, the sun crested the horizon over the mountains to the west, and it sent shafts of orange light across the canyon. Then a few of the red rock peaks lit up in the distance. As soon as the sun peeked over the mountains to the east, shafts of light cut across the canyon. If there is a place in this world to watch the sun come up, this is it. And what a spot for photography!! Until this moment, we had had the entire canyon to ourselves, but we’d heard a car drive up and park. As the sunlight grew brighter, we noticed a person sitting out on a ledge and soaking in the miracle of a new day arriving in this special place. Slowly, the sun’s rays lit up more and more of the canyon. Gradually, the shadows crept down the canyon walls as the sun highlighted their peaks. 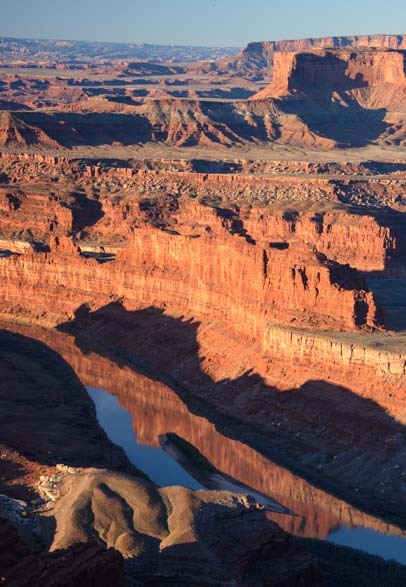 As the sun rose higher, the Colorado River began to reflect the orange cliffs in its depths. Magnificent! As we watched the splendor before us, we were surprised to hear the squawking of Canada Geese in the distance. They seemed to be way over on the opposite side of the canyon to the west. They never did come into view, but for about 5 minutes we could hear the flock talking together as they commuted down the river and across the canyon from the west side of the horizon to the east!! 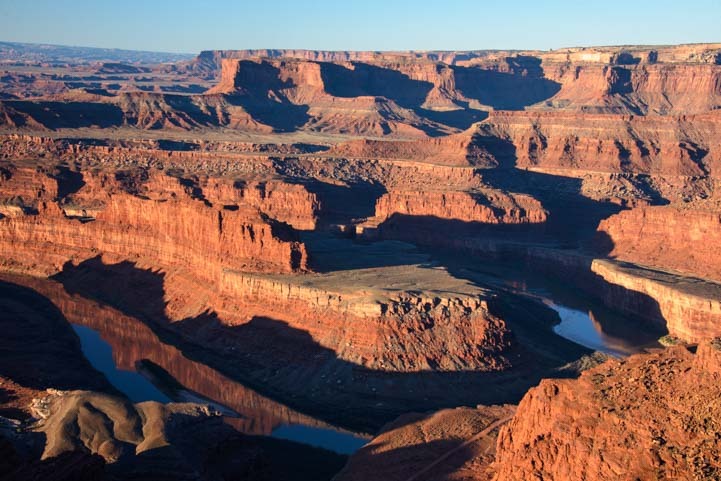 Light and shadow play on the rock faces of Dead Horse Point State Park. 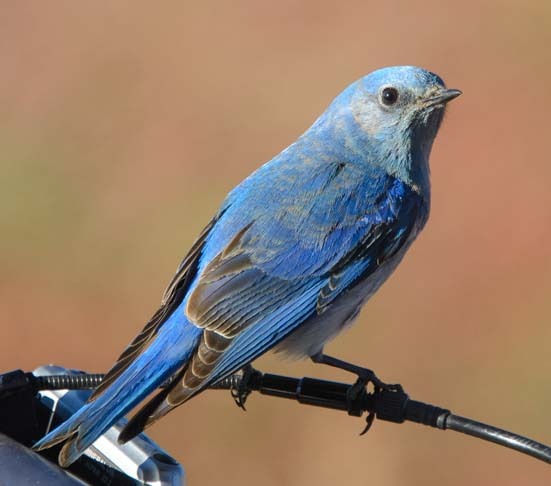 After the sunrise was over, we returned to our campsite where we noticed the most beautiful little blue bird flitting about out the back window of our trailer. He kept landing on the handlebars and shifting cables on our bicycles mounted on our bike rack. He seemed quite enamored of our bicycle bell! 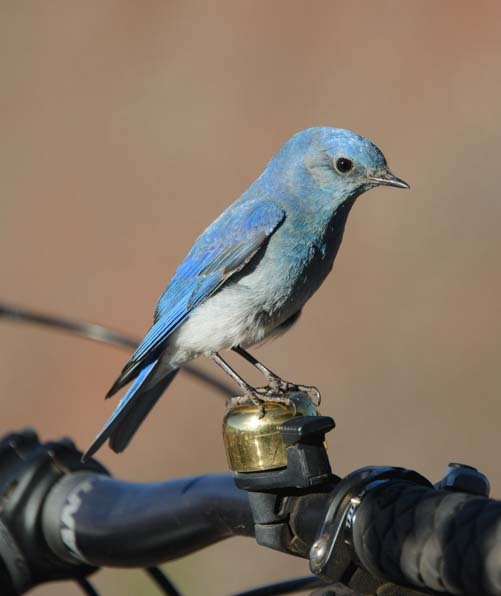 When we got back to camp, this little guy was hanging out on the handlebars of our bikes! Fortunately, he didn’t seem to be fazed by our movements inside the rig, and he settled down long enough for us to get a good look at him through the window and to get some really nice photos. 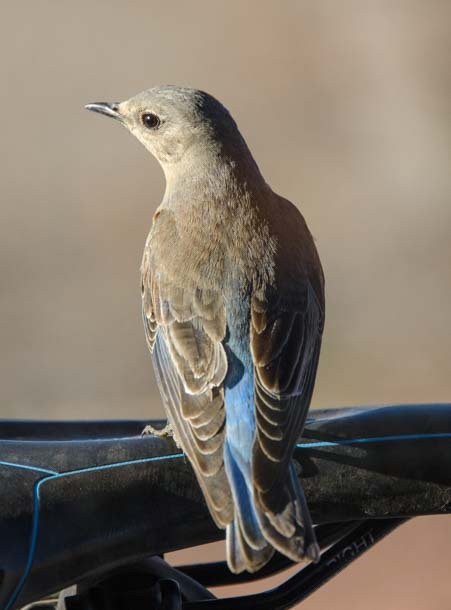 We checked him out in our bird guide, and he was a Mountain Bluebird. How cool! Then his little girlfriend stopped by. She was a real cutie too, with soft brown wings and a splash of Mountain Bluebird blue on her back! We never found out what these birds’ fascination was with our bikes on the back end of our RV, but they hung around for a very long time. Where our visit to Arches National Park had been shared with a gazillion other visitors, and our visit to the town of Moab had been a little wild during Jeep Safari week, the utter calm at Dead Horse Point State Park was intoxicating. At twilight we snuck back to the rim of the canyon and got some shots of the sunset on the horizon with a tree in the foreground. At twilight, the horizon turned vivid orange. 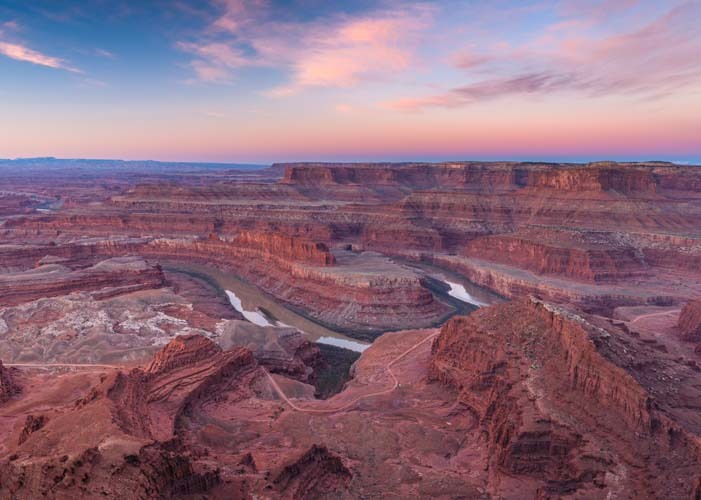 The sunrise at Dead Horse Point State Park is worth getting up for on any morning you are nearby, so we set our alarms each morning we were there, reminding ourselves as we groaned when it went off that it isn’t everyday you have a view like this within driving distance. Sunrise is worth getting up for in this neck of the woods! It was tough to climb out of our snug, warm bed to go stand at the rim of the canyon (in four layers of jackets) and wait for the sun to come up. But the beautiful photos and feeling of tranquility that reached across the miles and miles of canyon were well worth it. Little puffy clouds marched across the sky at dawn. One morning as I hiked across the huge, flat boulders towards the rim, I looked up and was astonished to find myself face to face with a white desert fox. I was loaded down with my camera, my pack, my tripod and my travel coffee mug, and I knew there was no way I could juggle it all and get his photo without scaring him off. So, I simply basked in the moment, and talked to him softly. His ears perked up in my direction and he took a long look at me. I admired his bushy white tail, tipped with a little black tuft at the end. To my utter surprise, he sat down for a moment! Then he got up and trotted away in silence on velvet paws. Once the sun was up, the puffy clouds turned white. The sunrises at Dead Horse Point were sensational, but that private moment with the desert fox in the dim pre-dawn light was extraordinary. Inspired by the professional videographers we met at Horsehoe Bend in Arizona, I set up a timelapse sequence on my camera to show the shadows retreating from the red rock canyon walls as the sun rose. What fun!! For those with limited bandwidth, this video is 19 MB and 20 seconds long. 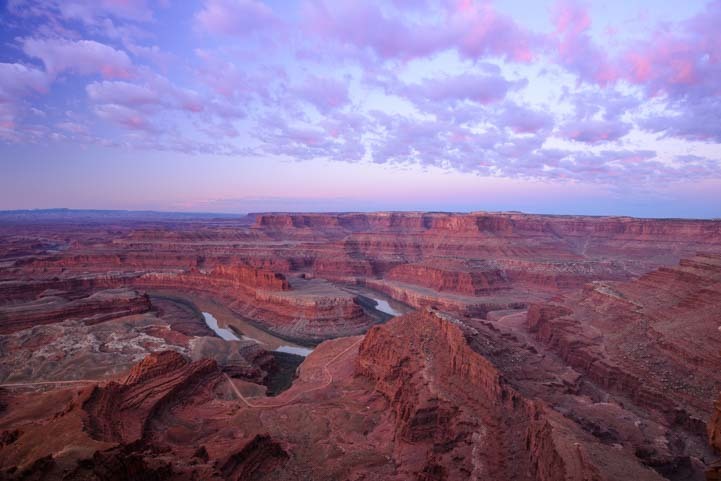 Dead Horse Point State Park is a fabulous place for outdoor lovers of all kinds to visit, and for RVers especially. There is a campground with electrical hookups within the park (no need for solar power!) 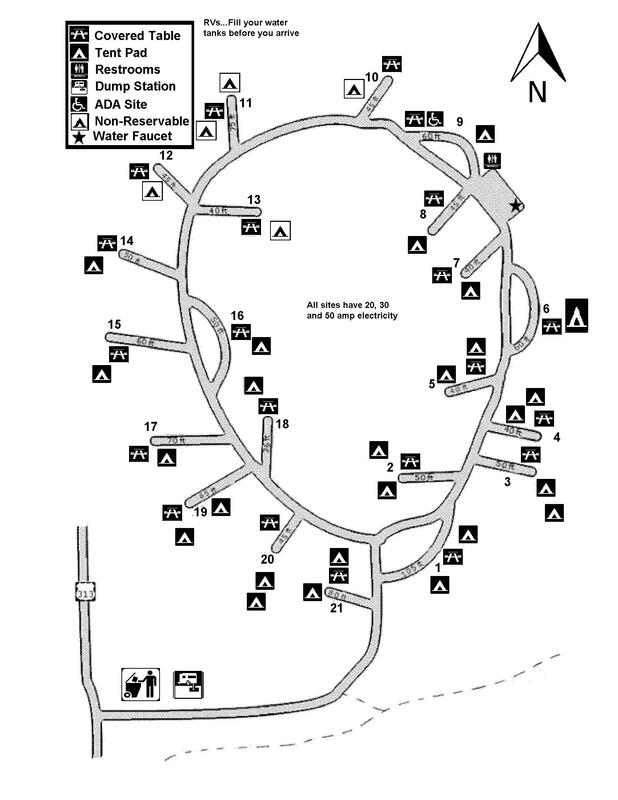 and loads of other campground options nearby (links below). In early April there were few people, if any, at the rim at dawn, but we have heard the place can be very busy at sunrise later in the season. We enjoyed the sunsets at Dead Horse too, but the sunrises were most magical for us. Does life get any better than this??!! The best viewpoints at dawn are to the west of the main overlook. Simply follow the paved trail heading to the right of the parking lot, and then cut across the rocks to the rim at whatever point looks appealing to you. 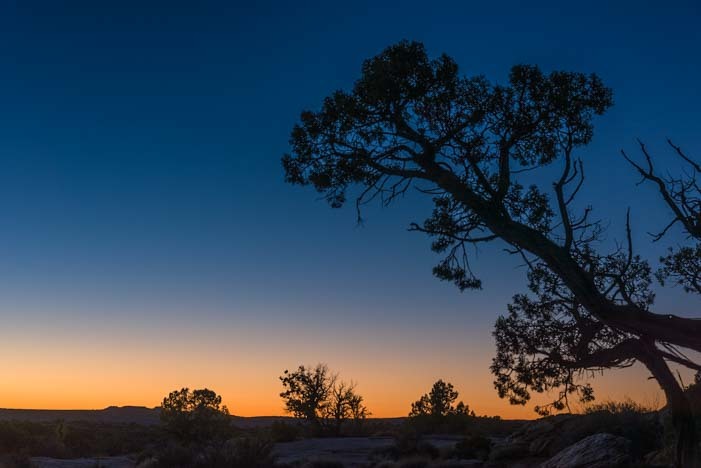 This entry was posted in Utah and tagged New, Time-lapse Video, Travel, USA, Utah, Utah Southeast, Utah Southern, WP Travel by Roads Less Traveled. Bookmark the permalink. Beautiful!! Awesome!! Thanks so much for sharing!! This is definitely going on my list of must sees! Beautiful photography and videography! Thank you, Cheryl. You’ll love it when you get there!!! The trouble with viewing the park before sunrise is that you have to get UP before sunrise[;. Pretty pictures. I never knew there was so much beauty in this part of the world! My husband and I are planning our trips for the next 6 months and this might be a place we have to see! Two questions you might be able to answer…. 1.) is there cell service in the campground there? (we need to work while we’re traveling) and 2.) What are the best months there, in terms of weather? I imagine there are some months that are just too hot. Thanks… we enjoy your site very much! 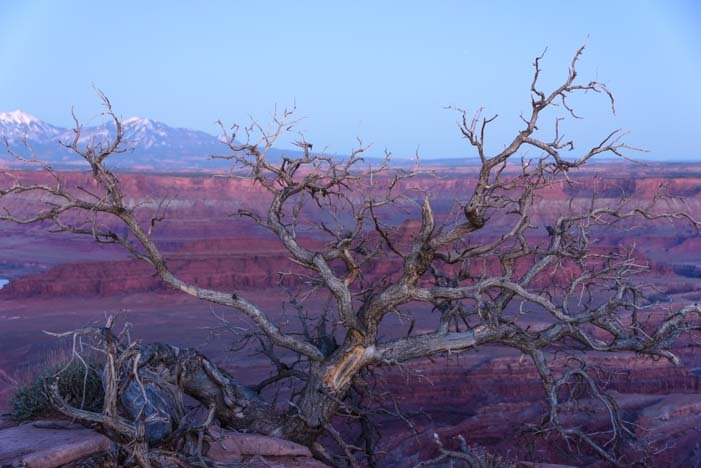 Utah is our favorite state in large part because it is the most beautiful — if you are into exotic rock formations! There is some Verizon cell phone service at the campground. 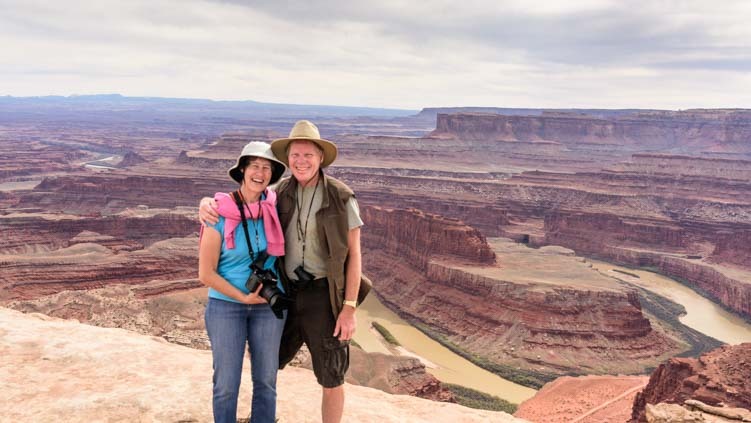 There are RV parks in Moab that have good cell service and they aren’t far away. The best time to go there is spring and fall. It is very hot in the summertime. Have fun and thanks for reading! 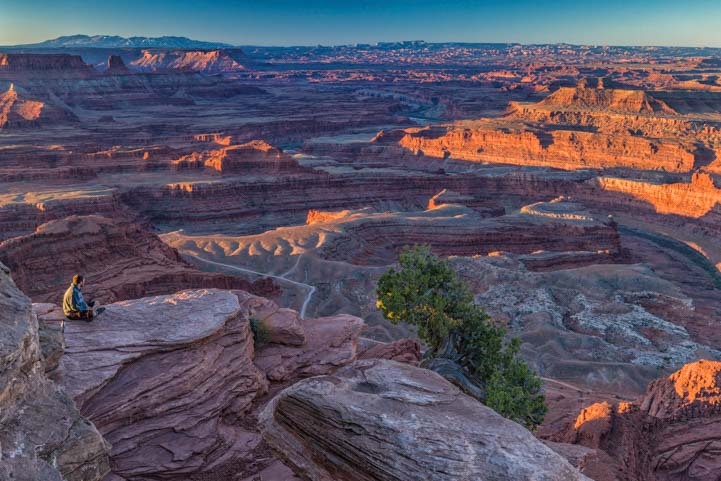 Dead Horse Point SP is indeed a beautiful canvas!! It was a privilege and a pleasure to be there and try to do it justice with our cameras. Amazing! what a great place. The pics remind us of the natural beauty all around us.